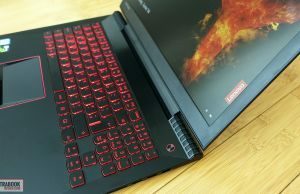 Summary: The Lenovo Legion Y520 is a great pick for those of you that only have about $900-$1000 to spend and want a good all-round laptop that can also handle FHD gaming well. 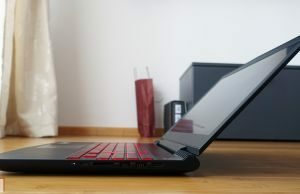 This one offers much for the buck and is overall a well built computer with a good keyboard, decent screen and solid everyday performance and behavior. Potential buyers will however have to accept the compromises Lenovo made with this device: the display is a little dim and not that color accurate, the speakers rather tiny and the battery life quite short. Read on for the whole story. 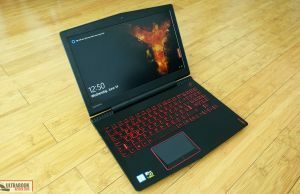 There are quite a few good gaming-laptops you can get for under $1000 these days, all of them bringing solid performance to the table, good builds and a few extras meant to tip the potential buyer towards each one’s side. 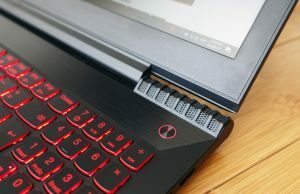 Lenovo’s offer in the niche is the Legion Y520, a 15-inch gaming laptop built on Intel Kaby Lake HQ processors, DDR4 RAM, Nvidia GTX 1050 and 1050 Ti graphics, as well as dual-storage. Specs wise, that’s on par with what the alternatives offer, but the Legion has at least two aces down its sleeve: a tamed down design, which makes it more appropriate for school and business environments than most other options, as well as its very competitive price (and not just in the US, but in Europe and other regions as well). On the other hand, the Legion Y520 offers a fairly dull display and one of the smallest battery in the segment, so it’s not just bells and whistles with this one. 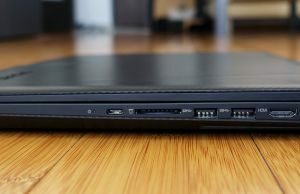 In fact, we’ve spent about two weeks with a Legion Y520 unit and you’ll find out impressions below, so keep reading if you have this laptop on your list and want to know where it excels and where it comes short. The Legion Y520 looks much like an ordinary laptop, little indicating this is a gaming machine, at least on a first look. 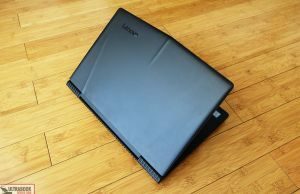 The outer case does get a faux carbon-fiber finishing and a few aesthetic bumps on the hood, but overall this notebook appears to be as simple as most other black plastic options out there. 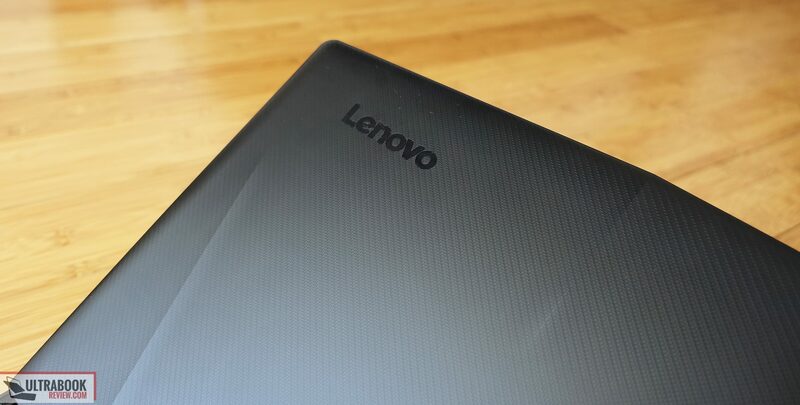 Even the Lenovo logo on the hood is black and blends in with the rest of the shell. 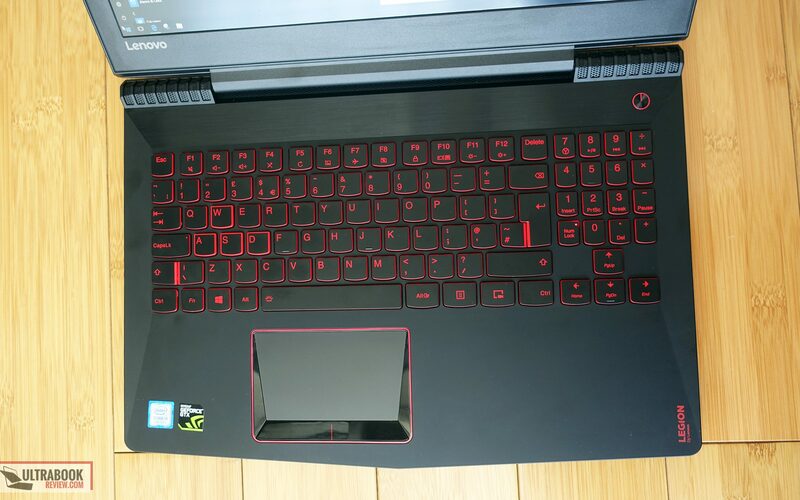 Once you open the lid you’ll notice the red keyboard, shinny red frame around the trackpad and the red Legion branding in the lower-right corner of the palm-rest, which suggest the gaming DNA of this machine. 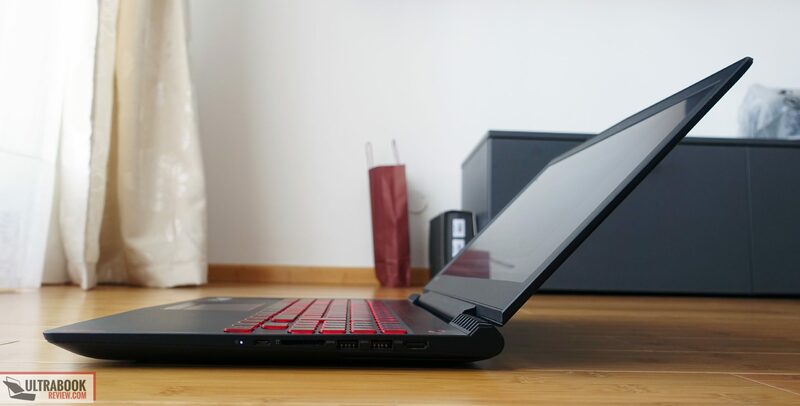 Overall though, the Y520 is one of the most subtle laptops you can find in its class, alongside the black version of the Dell Inspiron Gaming, and that opens for it doors to academic or business environments where flashy laptops aren’t accepted. So if you want an all rounder that you can take to school and work if needed, this Lenovo Legion fits right in. It’s not very portable, at 2.4 lbs and 15 x 10.5 x 1 inches, but it’s not bulkier or heavier than most other devices with similar traits and a similar price. 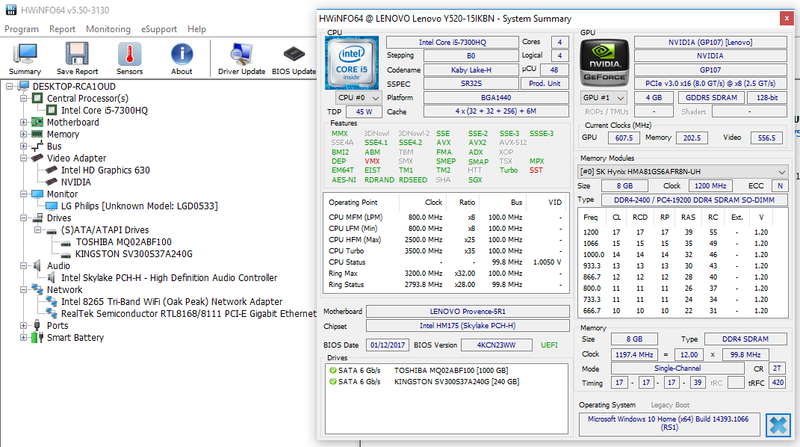 Looks aside, the Legion Y520 is also fairly well built. It’s entirely made out of plastic and there’s flex in the lid cover, but not to the point where it puts pressure on the panel. The inner frame is much sturdier though and it doesn’t give at all with daily use and typing. 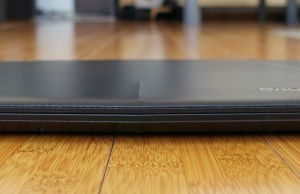 As far as the choice in finishing goes, Lenovo uses the carbon-fiber imitation for the lid, sides and back, while on the interior they went for the brushed plastic on top of the keyboard and a smooth soft plastic for the keyboard area and arm-rest, which does feel comfortable in daily use. In fact, the entire laptop feels very nice, with no sharp edges and pointy corners, a screen that can be lifted with a single hand and solid rubber feet on the bottom that keep it properly anchored on a desk. You’ll notice these if you flip this device upside down, and you’ll also notice down here the generous air-intake cuts. Air is drown through these cuts and through the mesh just beneath the screen’s hinge, and then pushed out through the grills on the back edge. There’s no bay that allows quick access to the hardware on the back (yet the access is fairly simple, we’ll address it in a later section) and there are no speaker cuts either, and that’s because the speakers are placed at the top, flaking the screen’s hinge. 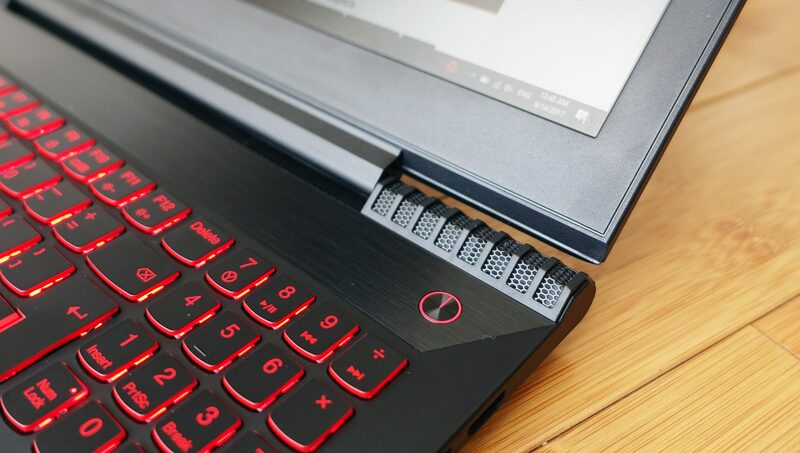 As for the hinge, it goes back to about 150 degrees, operates much smoother than on the older Lenovo Y laptops and properly keeps the screen in place, so I’ve nothing to complain about here. In fact, except perhaps the inconvenience of those black surfaces showing smudges easily, there’s nothing wrong with how this laptop looks and feels. 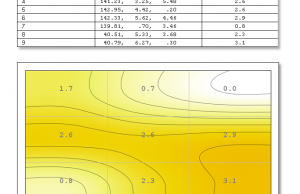 One final aspect we have to mention is the IO, lined around the left and right edge. 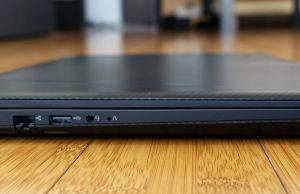 The Y520 offers 3 full-size USB ports and an USB Type-C connector (gen 1, no TB3 support), HDMI for video output, a LAN port and a Kensignton lock. The PSU and LAN are placed on the left side, but the HDMI and USB 3.0 slots are on the right and will clutter your mouse area if you plan to use many peripherals. 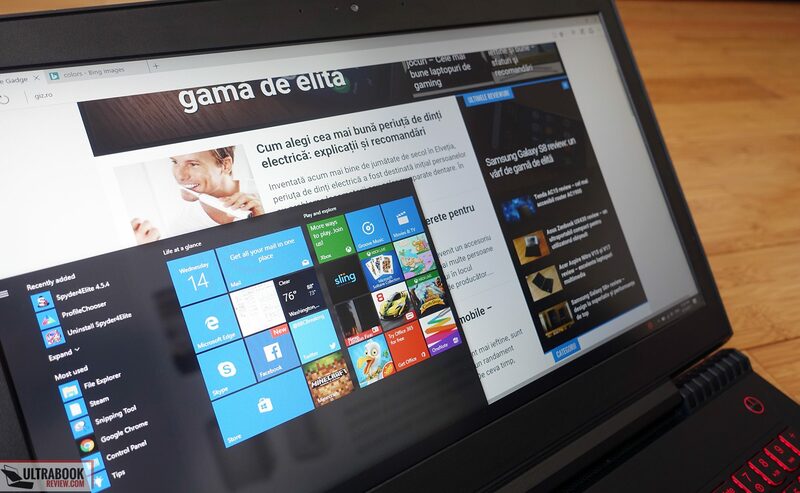 We got to test the European version of the Y520 with the standard layout for the region, of which I’m not a big fan of, as it comes with a tiny left Shift and the tall Enter keys. The US layout is better in my opinion. Main keys aside though, this keyboard does include a NumPad section with a very peculiar arrangement. There are no dedicated Home, End, Pg Dn, Pg Up, Prt Scr keys, as these are all integrated as secondary functions on the NumPad and the directional keys, and that’s going to require timed to get used to. Casual users will probably be able to live with these changes, but professionals might not. 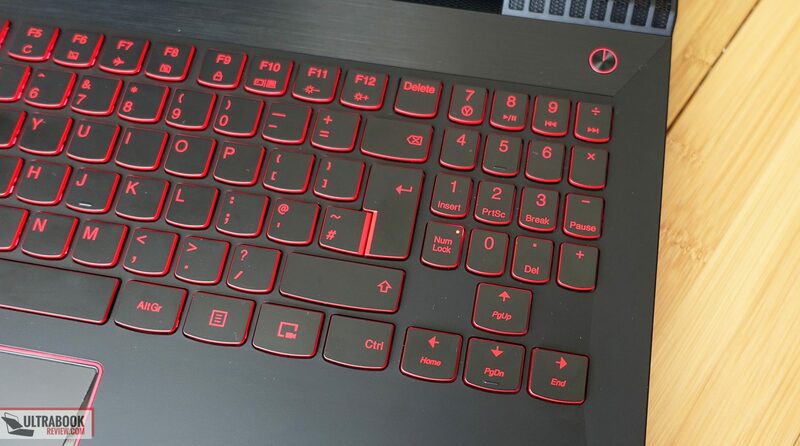 This implementation does lead to big and nicely spaced directional keys, which those interested in this laptop primarily for gaming will surely appreciate, so in the end the layout comes with pros and flaws, and it’s up to you whether it rubs you the right way or not. 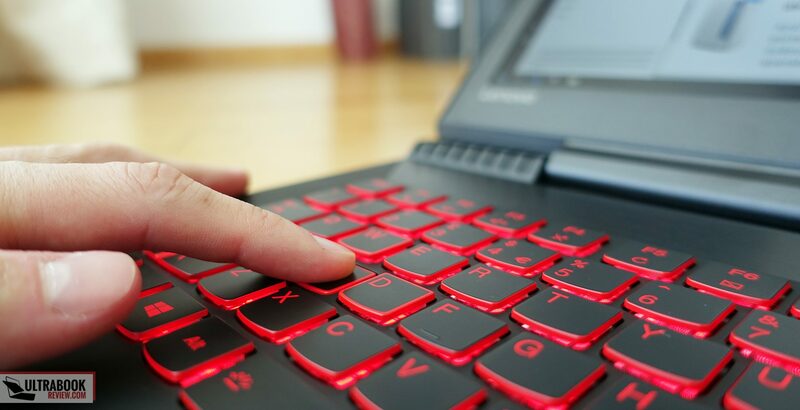 As far as the typing experience goes, I can say this was one of my favorite laptops to type on. Keep in mind I’m used to low-travel low-resistance keys (1.2 mm stroke depth and average resistance), which is what you’ll get here. If you’re too, you’ll find this keyboard’s feedback pretty good and enjoy the keys’ soft feel, their speed and accuracy. 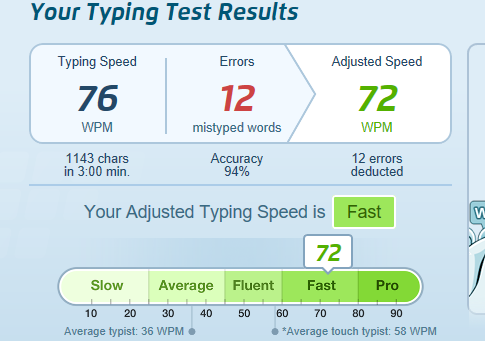 I did score a fairly high percentage of missed strokes on this test unit, but most of those were caused by the small left-Shift key that I’m not accustomed to. 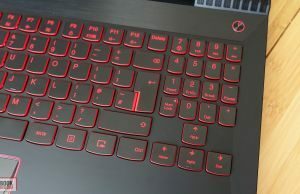 The keyboard is also backlit, with red LEDs and two levels of brightness to choose from. As a side note, quite a few users report issues with specific keys not registering on their Y520. 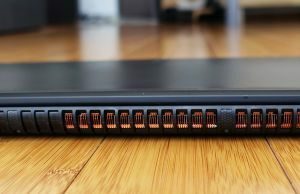 I didn’t run into this issue, but it seems to be quite widespread and according to the forums, it’s caused by the improper positioning of the metal shield that covers the RAM slots and can be fixed, as per the details in this thread. Chances are this issue will occur if you remove the shield in order to add more RAM to you unit, but there’s also a fair chance that shield is wrongly placed out of the factory. The trackpad is placed beneath the keyboard and stands our both visually and tactilely. It’s framed by a shinny red border and a shinny black edge that gets narrower towards the bottom of the surface, making the trackpad trapezoidal in shape, but takes a toll on its overall size, which is not that generous to begin with. 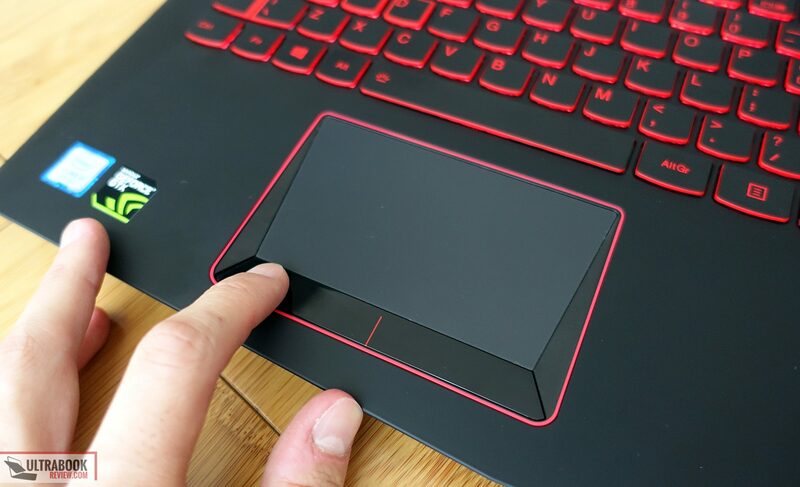 This is a Synaptics trackpad, so it performs fairly well with daily use and feels smooth enough, despite being made out of plastic. I found it too slow for my taste out of the box, but there are a lot of customization options with the Synaptics driver to address that. I couldn’t find a way to enable two-finger taps though or two-finger Back and Forward gestures in the browser. On top of these, this is not a clickpad, which means its surface is fixed and there are dedicated click buttons beneath. I’m usually a fan of dedicated buttons, but this implementation is rather mediocre, as the right and left buttons are bound together and not independent, which means they only depress of you hit them at their lateral edges. 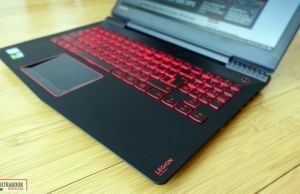 Lenovo put some crappy screens on their older gaming laptop, so what the Legion Y520 gets is a major step-up in the right direction, but still only a mid tier option when compared to what’s available out there. 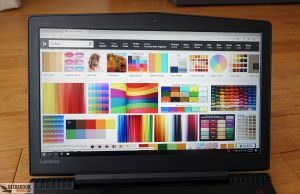 In other words, there’s a 15.6-inch matte IPS panel on this laptop capable of average brightness and contrast, yet lacking in terms of color coverage and accuracy. 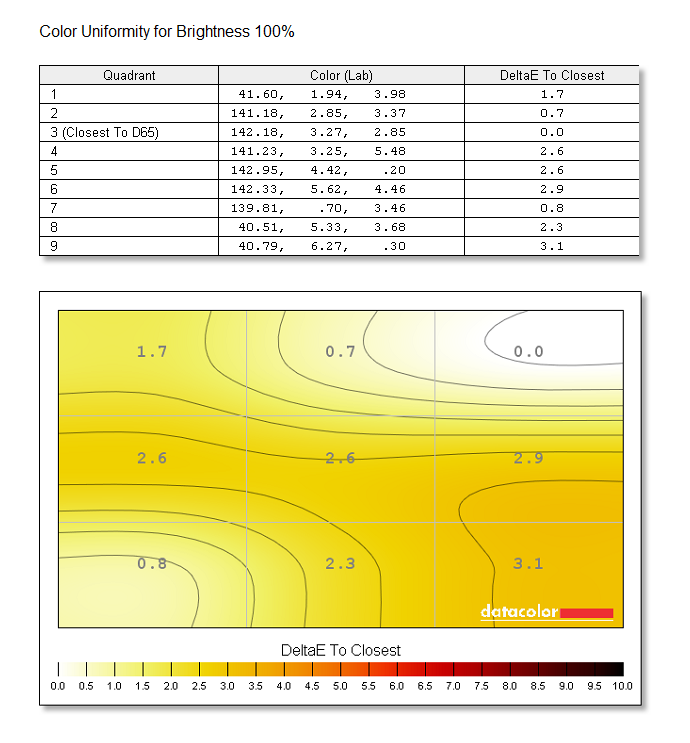 You can improve the gamma and color rendition with the help of this calibrated color profile, but at 49% Adobe RGB coverage, this is not the panel professionals would choose for anything that requires accurate colors. 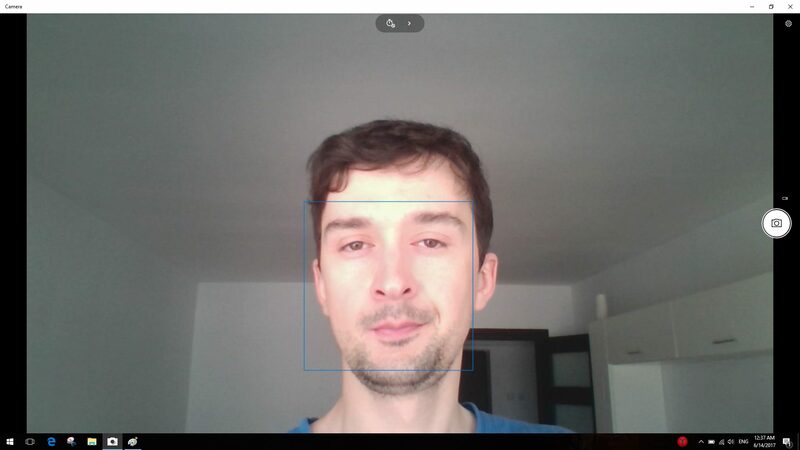 You’ll find more details about the panel below, taken with the Sypder4 color sensor. At 260 nits max brightness, this screen is going to be good enough for indoor use, but will struggle in bright places or outdoors. 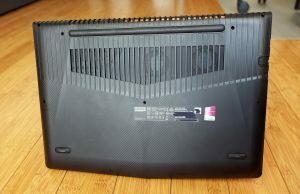 Still, it’s on par with what most other OEMs put on their sub $1000 laptops and variations of this panel are actually used on higher-tier computers as well, like the Acer Predator Helios 300. 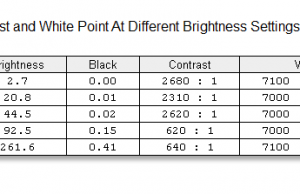 What could steer some of you towards something else is the fact that the panel does use PWM across the entire brightness range though, as shwon in this article. That aside, I should also add that our test unit didn’t show any obvious light bleeding around the frame, yet some users on the forums do complain about the bezel pinching the screen. That’s a quality control issue and whether your unit will end up with some bleeding or not is just a mater of luck, as with most laptops in this price range nowadays. Make sure you buy from a place that allows easy returns, in case you draw the short stick. 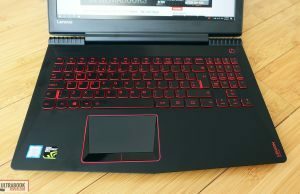 The Lenovo Legion Y520 is available in a few different configurations, and we got to test the most basic one available here in Europe, with a Core i5-7300HQ processor, 8 GB of DDR4 RAM, a 1 TB 5400 rpm 2.5″ HDD and Nvidia GTX 1050 graphics with 4 GB of DDR5 RAM. 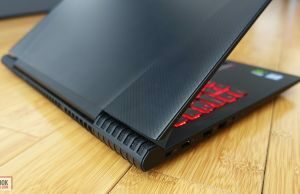 If you decide to buy one of these laptops, I advise you to opt for one of the GTX 1050 Ti configurations and either get an SSD out of the box, or add one yourself. 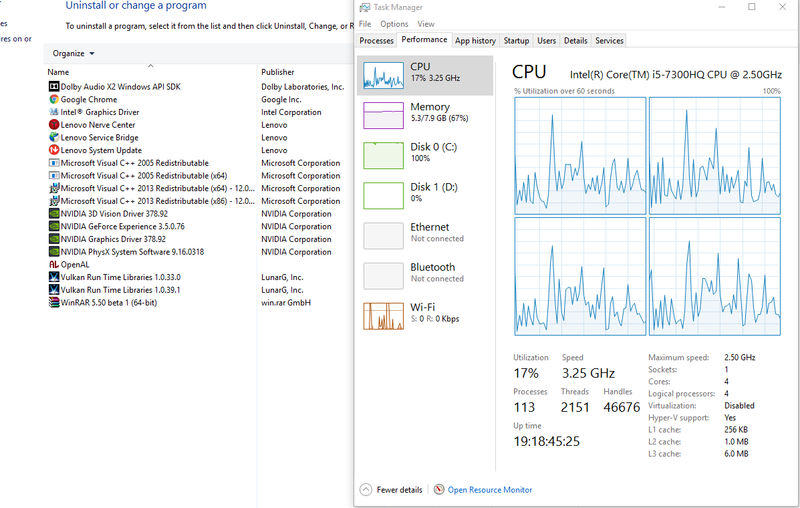 It’s been a while since I’ve tested a laptop without an SSD, and boy that puts a halt on multitasking performance. 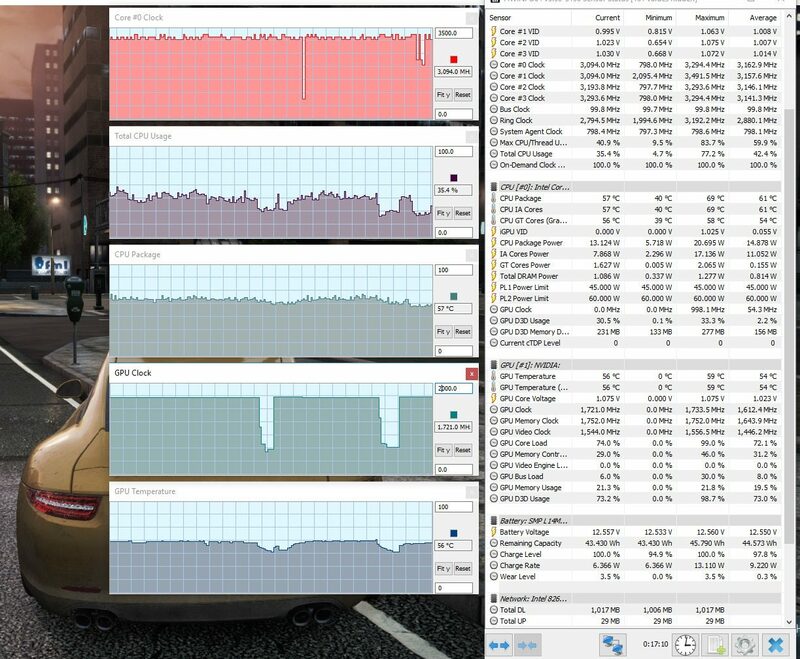 With an SSD and preferably 16 GB of RAM, this laptop will be able to handle daily activities and games just fine. 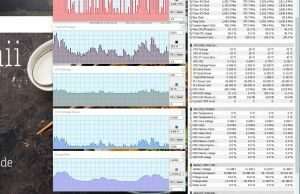 The Core i7-7700HQ CPU is an option as well, but one you’d only need if you plan to run more demanding software that can benefit from its HyperThreading support, software like Photoshop, Premiere and other graphics editing programs, among others. If those are not on your list, just stick with the Core i5 and put the money you save up towards the RAM or SSD. 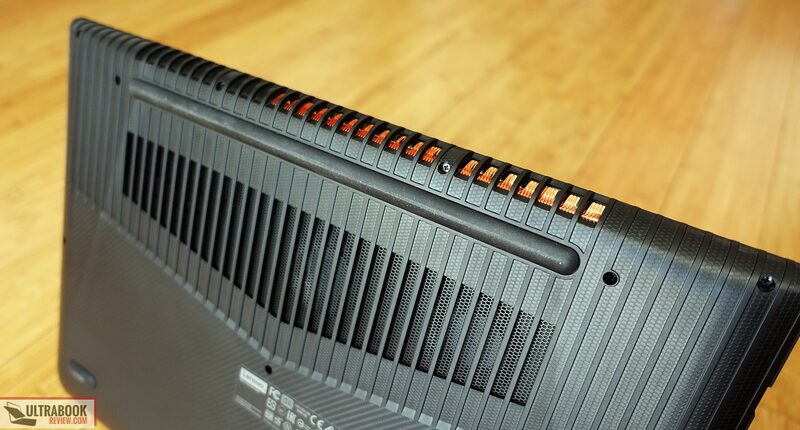 There’s no quick-access bay for the internals on the Y520, so you’ll have to unscrew the entire back panel to get inside. It’s hold in place by a dozen Philips screws and shouldn’t take you more than a few minutes. 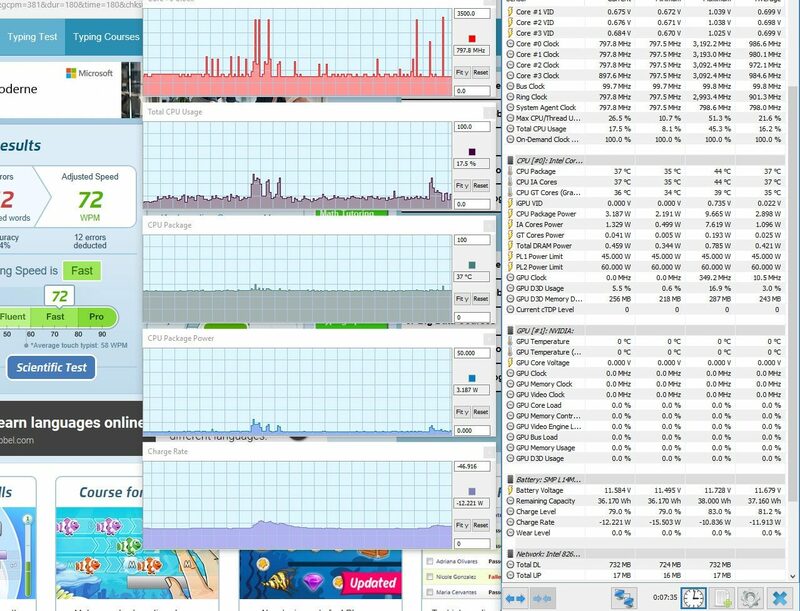 Once in here, you’ll notice that the HDD, Wi-Fi and M.2 SSD are easily accessible. Our unit doesn’t have an SSD, so the M.2 80 mm slot is unoccupied. 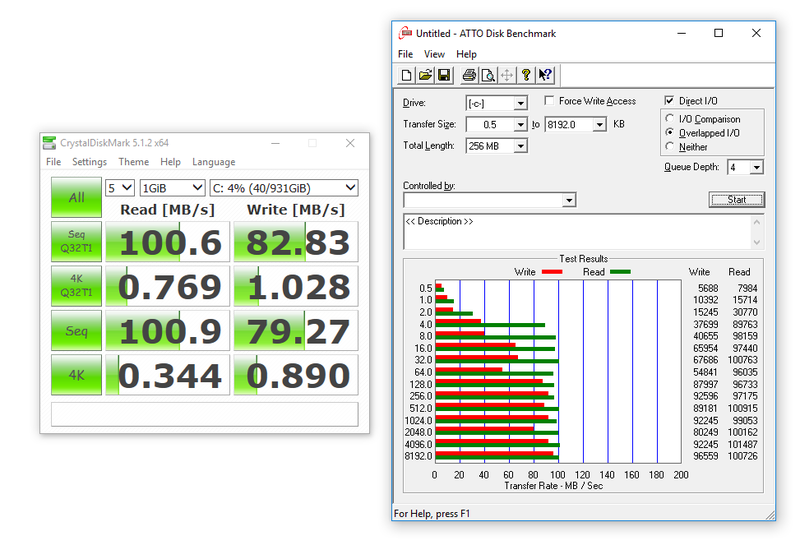 As an important note, this laptop only supports M.2 SATA drives, so don’t buy a PCIe SSD, you’ll not benefit from its faster speeds. Look like I was wrong, PCIe M.2 SSDs are also compatible (Thanks Szilard for the head-up in the comments). The memory is also upgradeable, but it’s hidden behind a metallic shield cover. You’ll need to loosen up the pins that hold it tied in place and pull it up to get to the two DIMMs underneath. It’s extremely important to make sure you properly put this shield back in place afterwards, cause otherwise it can interfere with the keyboard’s pins that are placed in very close proximity. Details in here. 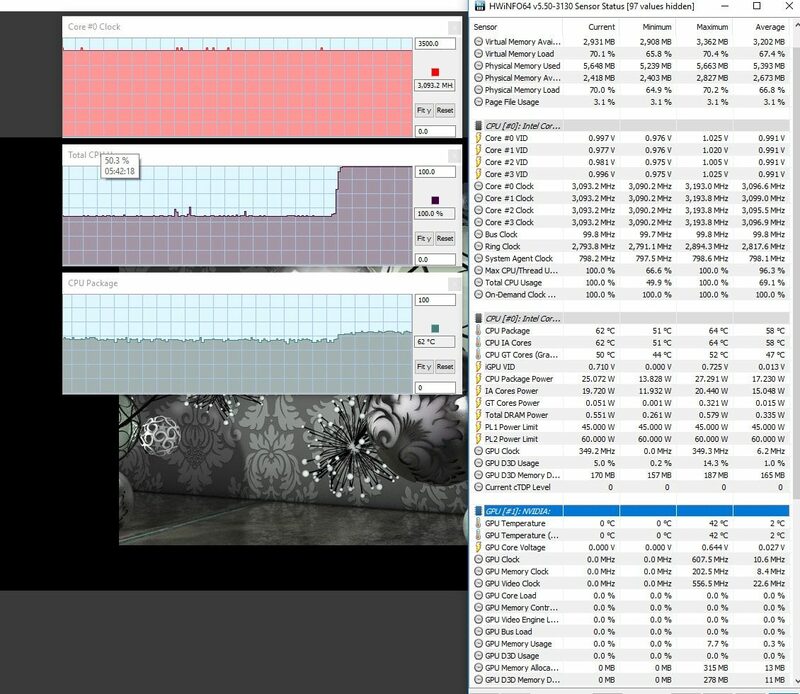 Back to our test unit, I’m not going to add benchmark performances here just because I don’t think those are relevant on a configuration without an SSD. 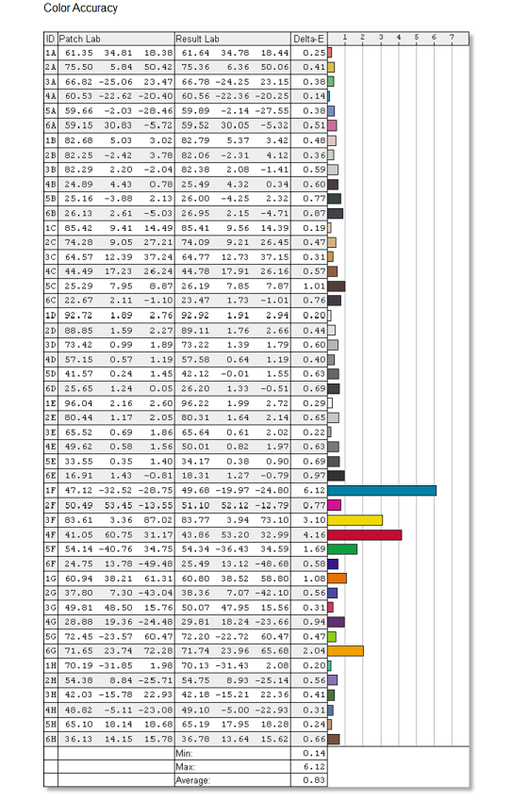 You will however find details on the performance and inner temperatures of our sample in certain daily use scenarios, including gaming, below. I also tested a few games, and here’s what we got. As also noted in this general article that compares the 1050 and 1050 Ti chips, the latter offers a significant boost in performance for a marginal price increase, that’s why it is for sure the option I’d recommend between the two. Overall, the GTX 1050 Ti chip will handle most modern games available today and launched in the next 1-2 years on 1080p resolution with Medium to High details, as well as most older games with maximum graphics settings. 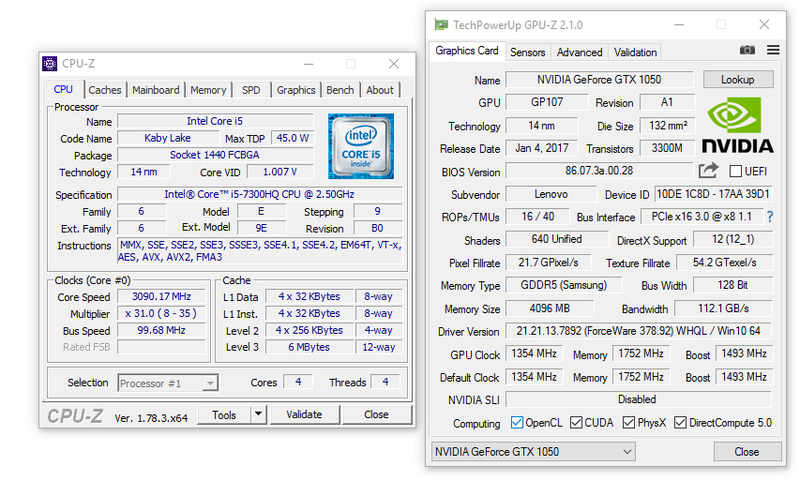 I also have to add that I didn’t notice any throttling or performance drops during our tests of this Legion Y520 sample, but keep in mind we did review the Core i5 configuration with GTX 1050 graphics. 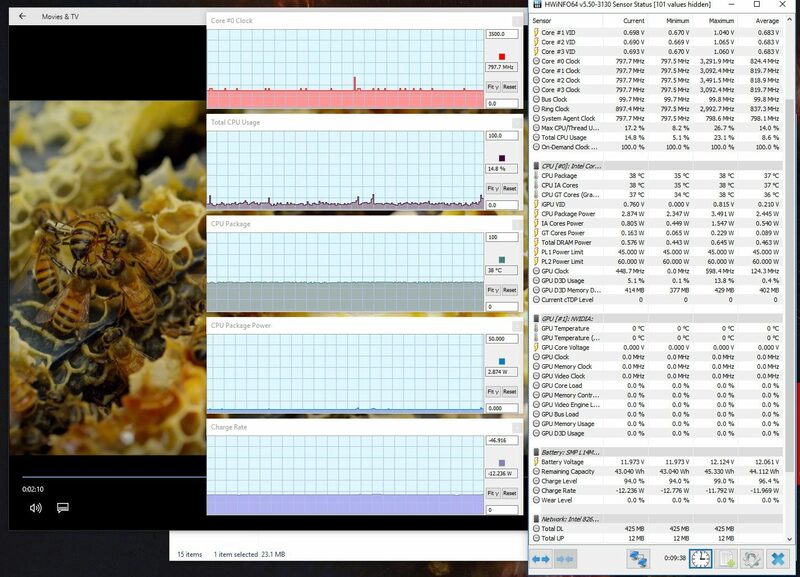 I’ve seen some reviews claiming that the CPU throttles in stress tests, but with realistic demanding scenarios (gaming, video editing) even the Core i7 configurations with GTX 1050 Ti graphics perform well, with the cooling solution being able to maintain the internals properly cooled. And that’s despite the fact that its design can be considered outdated, as it doesn’t use individual heatpipes for the CPU and GPU, but heatpipes that spread across both of them at the same time. 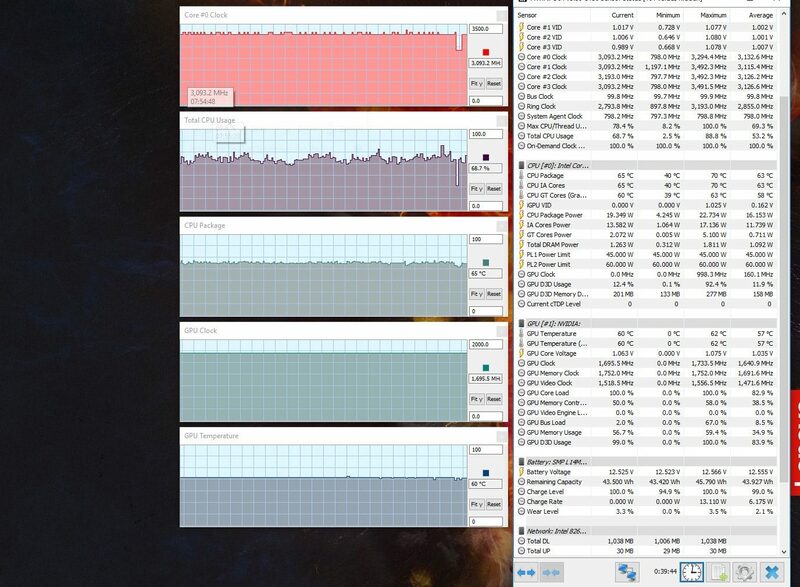 This however translates in both of the internal fans spinning simultaneously when required, while independent configurations would have allowed only the CPU fan to run with daily activities, with the GPU fan remaining idle until needed. 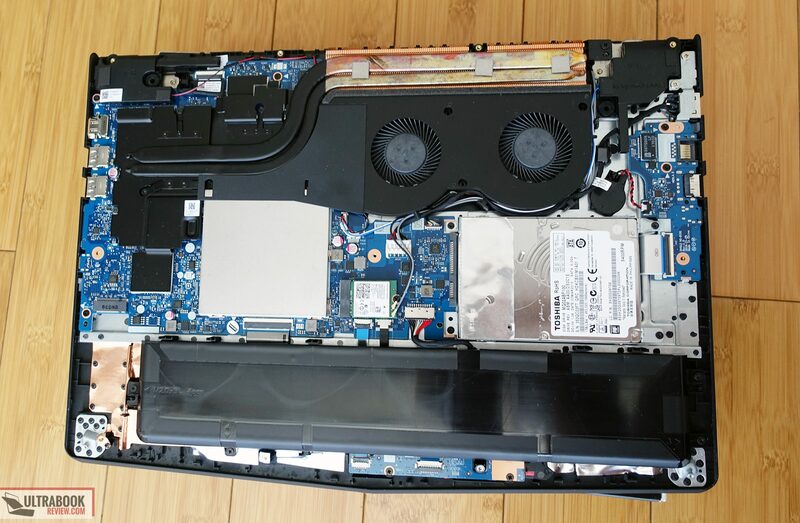 Still, while the fans are spinning pretty much all the time on this laptop, they are only audible in very quiet environments with everyday use like browsing or watching movies, and can be easily covered by the speakers. The spinning HDD is also a noise source you’ll notice in this case. 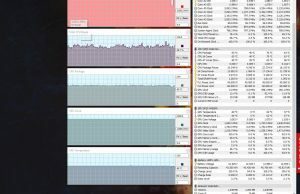 I do believe the fans don’t have to spin with daily tasks though, the internal temperatures measured in our tests and the laptop’s big air intake cuts could allow it to run passively just fine with a less aggressive fan profile. That would be a solid selling point for me, but very few OEMs offer this on their quad-core full-size laptops. In fact, I only encountered one, the Dell Inspiron Gaming 15. The fans do get noisier under load on the Legion, and I’ve measured noise levels of around 43-44 dB at head-level in gaming, which is about average for this class. There’s also an Extreme mode you can set the fans to, which spins them at max rpm and jumps the noise to 48 dB, but there was really no need for it in actual use, even when running demanding games for hours. 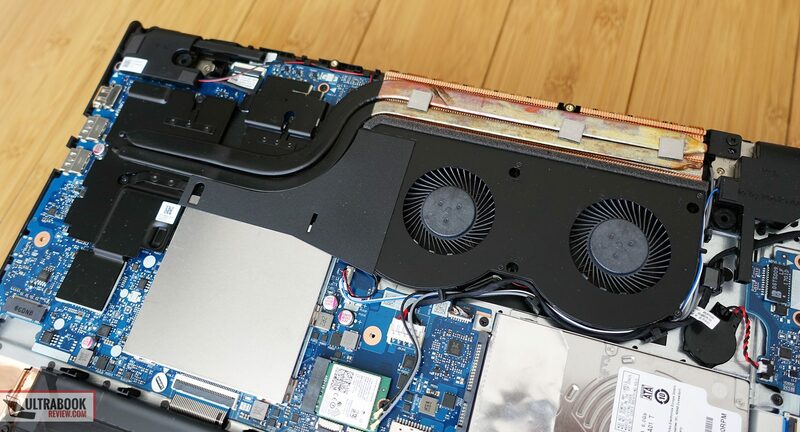 In fact, the cooling was able to keep both the internals and outer shell temperatures at bay on this notebook, but again keep in mind the GTX 1050 Ti option will run somewhat warmer, and the Core i7 processor will take a toll as well if you opt for one of those higher-tier configurations. 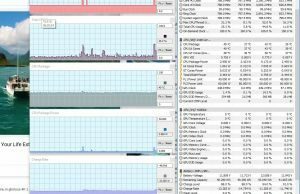 This article shows temperatures under loads for the Core i7 + GTX 1050 Ti model, but bellow you’ll find what we measured on the Core i5 / GTX 1050 model we tested. Connectivity wise, there’s Gigabit LAN, Wireless AC and Bluetooth on this laptop. 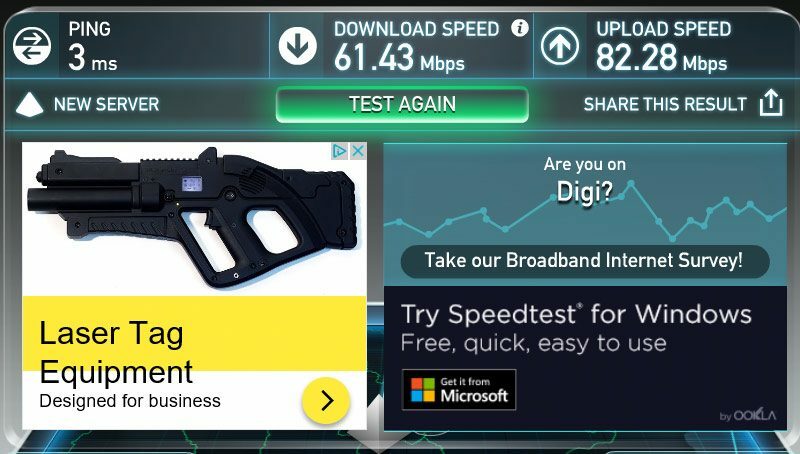 I’ve only used it on Wi-Fi and the Intel wireless module corroborated with the all plastic case performs really well. 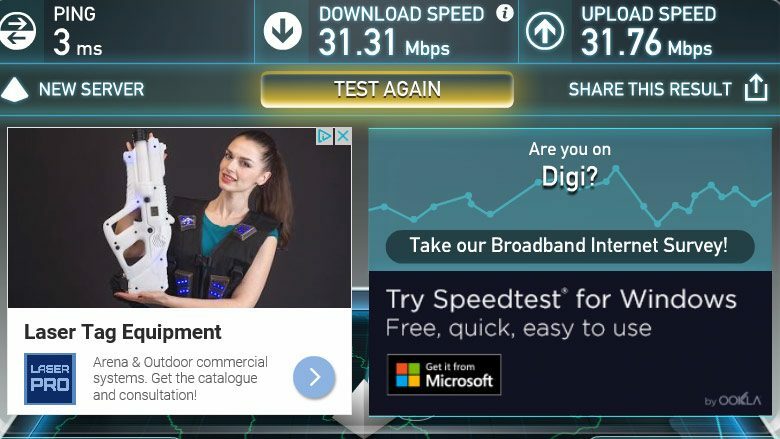 It tops my Internet speed near the router and while the speeds drop at 30 feet with 2 walls in between, I didn’t run into any buffering or stuttering at any point, and I also didn’t’ experience any disconnects and drops. As far as the speakers go, Lenovo advertises a Harman Kardon implementation with stereo 2 W speakers for the Legion Y520. The fact that the speakers are placed on top of the main chassis and not on the underbelly is the big selling point compared to the competition here, but the overall sound quality provided by these speakers isn’t convincing. The volume is average to good, at up to 78 dB measured in our tests and head-level, but these speakers do lack bass and as a result sound tinny, hollow. I can’t say there’s significantly better audio on other laptops in this class, but the overall impression left here wasn’t memorable. One final thing to mention in this section is the webcam, which is also rather mediocre. Will do for occasional calls, but it’s washed out and dull looking. There’s only a 45 Wh battery on the Legion Y520, the smallest one available in its class, and as a result you shouldn’t expect more than 2-4 hours of daily use on a charge, or just shy of 50 minutes while running games. 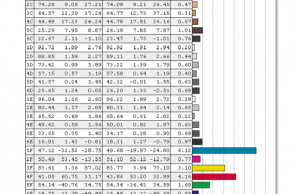 Here’s what we got in our tests, with the screen set at 50% brightness, roughly 120 nits. 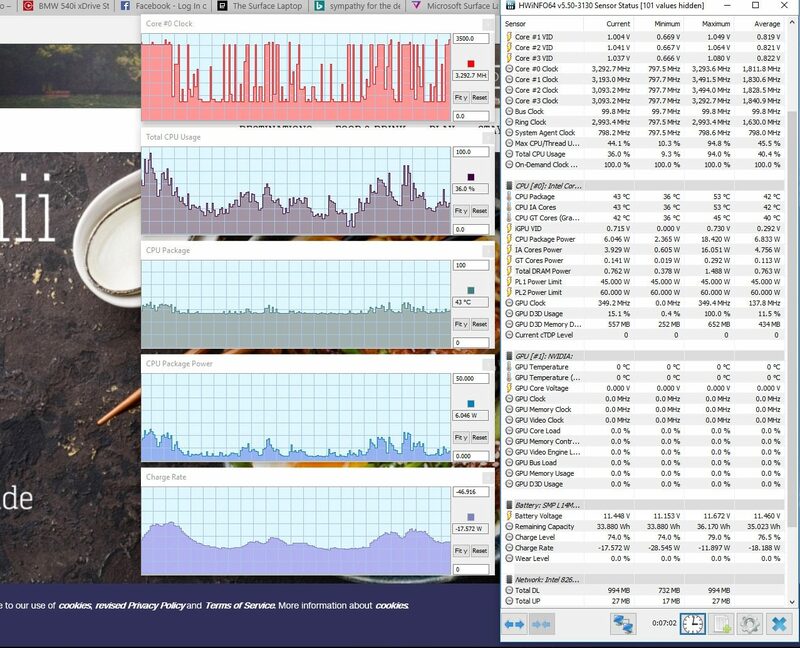 50.0 W (~50 min of use) – gaming, High Performance Mode, screen at 50%, Wi-Fi ON. This laptops comes with a standard 135 Wh power brick and a full charge takes around 2 hours. The Lenovo Legion Y520 is available in stores around the world in multiple configurations, with prices starting at under $800 in the US at the time of this article. The best-buy option gets you the Core i5-7300HQ processor, 8 GB of RAM and the Nvidia GTX 1050 Ti graphics, starting at around $850. 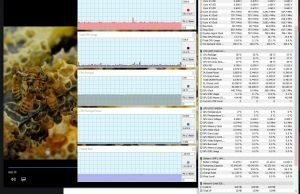 You can opt for this one and then add more RAM or an SSD yourself, or you can keep an eye on for discounted higher-tier models already equipped with 16 GB of RAM and a SSD that should go for around $900. Those interested in the Core i7 processors will also find Core i7-7700HQ configurations with 16 GB of RAM, SSD + HDD storage and the GTX 1050 Ti graphics for just shy of $1000. Follow this link for updated configurations and prices at the time you’re reading this article. 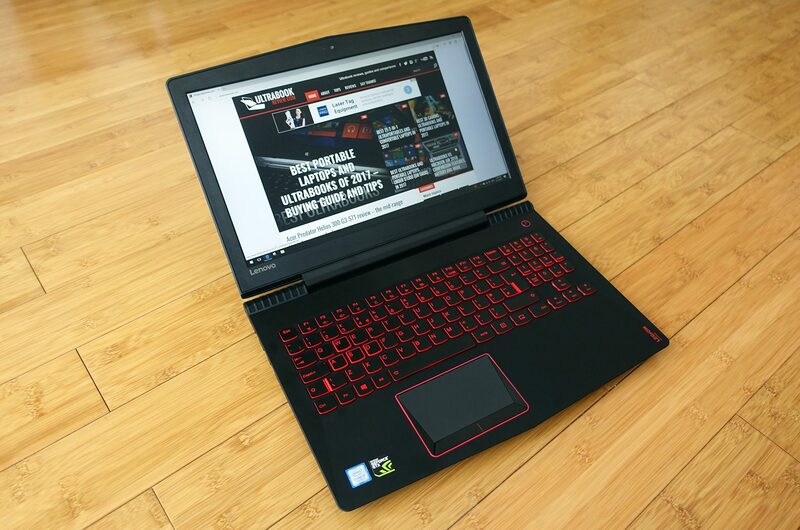 There’s good value in the Legion Y520 and after spending the last two weeks with our sample, I believe this is one of the best bang-for-the-buck gaming laptops available in the sub $1000 price range. 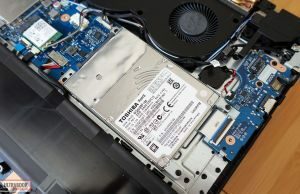 Just make sure you get a configuration with SSD storage, like that $900 model mentioned in the previous chapter, that should satisfy most potential customers. 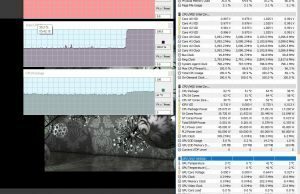 At this level the alternatives to consider at time of this article are Acer’s Aspire VX15, Acer’s Nitro 5 and Dell’s Inspiron Gaming 15, but with others to come in the future as well. 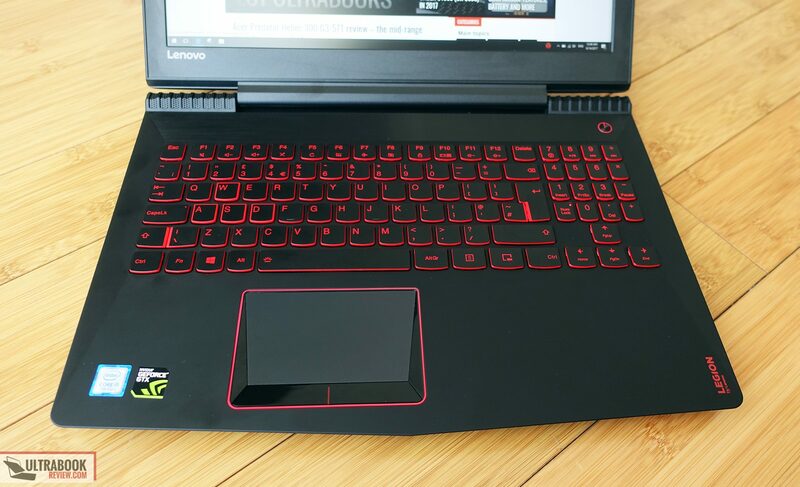 Out of those three, the Acer Aspire VX15 looks more like a gaming laptop and actually includes 16 GB of RAM and a 256 GB SSD for $899, so is more affordable spec-per-spec than the Legion, but still comes with a rather poor screen and small battery, as you can see in our review. 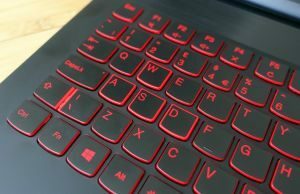 The Acer Nitro 5 gets different, simpler looks, but otherwise is very similar to the Aspire VX15. 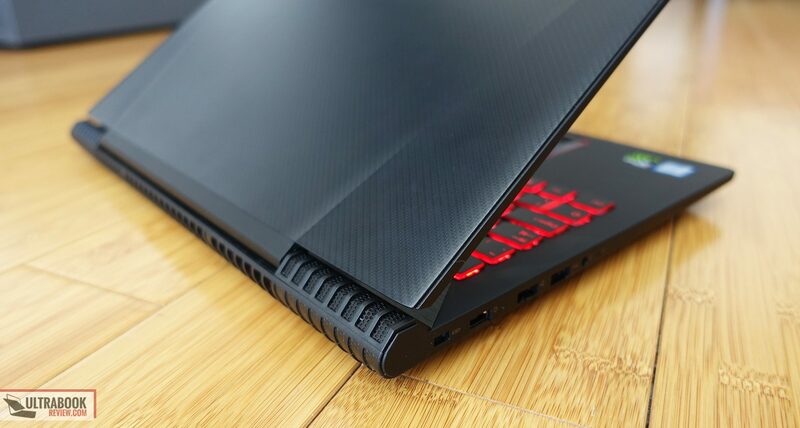 The Inspiron Gaming 15 on the other hand is only an option in the US, as Dell’s pricing is not that friendly in other regions, but it is a better built laptop with simple looks and a much bigger battery, yet a TN screen on the base configurations, as shown in our review. 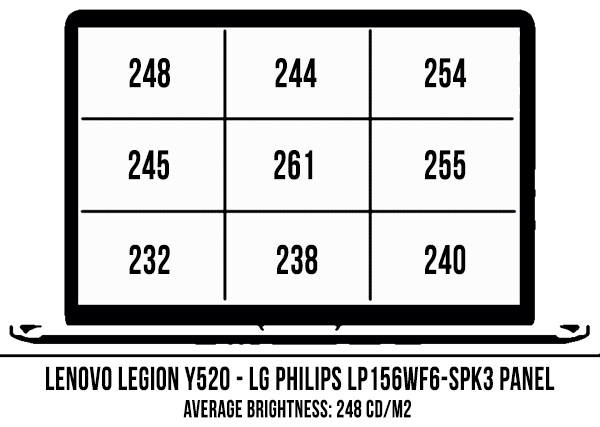 But even with those two out there, the Legion Y520 can be the right pick for many of you. 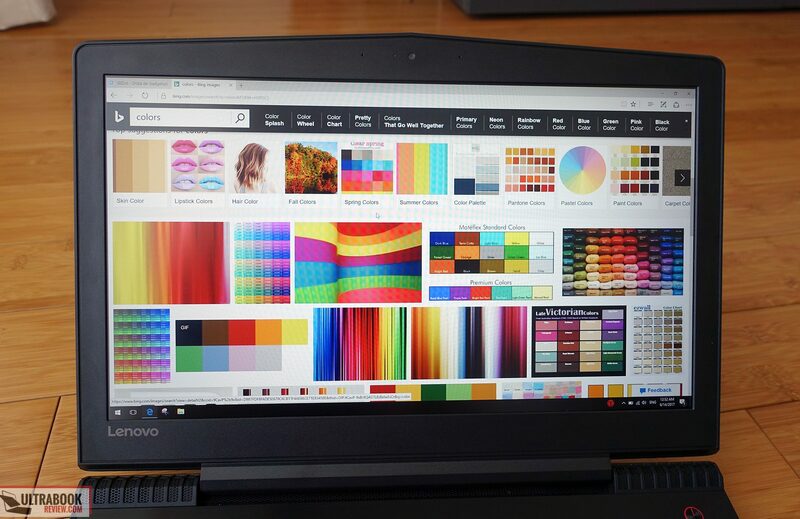 When we draw the line, it is a well built laptop with a decent matte IPS screen and a very nice keyboard, a laptop that performs well and runs cool and averagely loud. On the other hand, it’s not going to last longer than 4 hours on a charge, its screen makes it unsuited for activities that demand good color accuracy and its speakers sound rather tinny, so it’s up to you if you can live with these shortcomings or not. 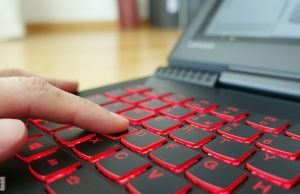 Just keep in mind there’s no perfect laptop, and you will have to compromise when you want powerful hardware for as little money as possible. 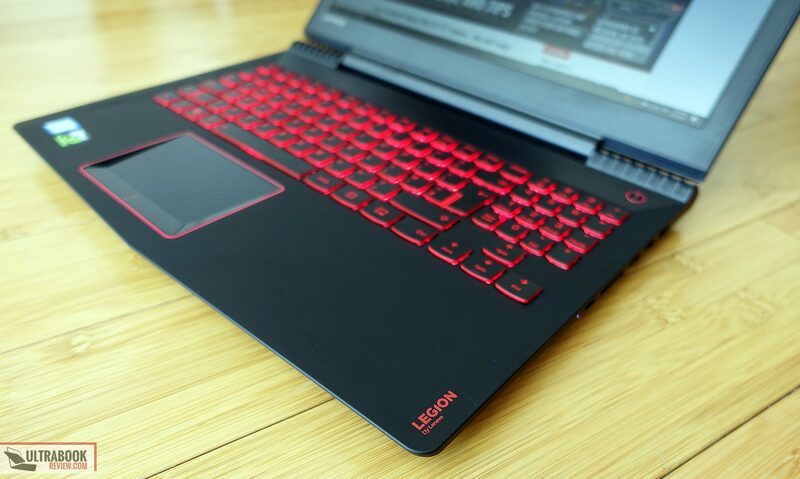 That pretty much wraps up our review of the Lenovo Legion Y520. Let me know what you think of it and get in touch in the comments section if you have any questions or anything to add to our impressions, I’m around and ready to reply and help out if I can. 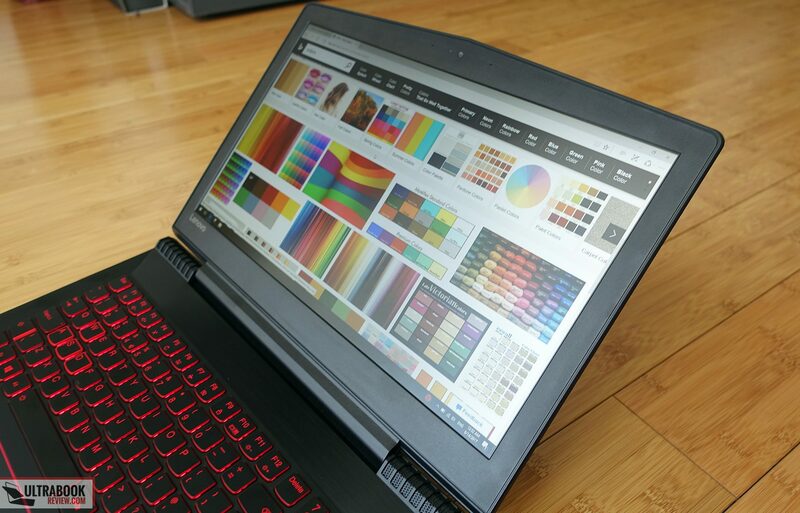 Hello there, i wanted to ask for your advice about the lenovo brand, some rumors has it that lenovo laptops arent actually good in terms of their longevity. 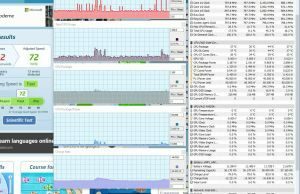 Most of its customers has problems on the laptop after a few months of usage. From your perspective/opinion is it true ? 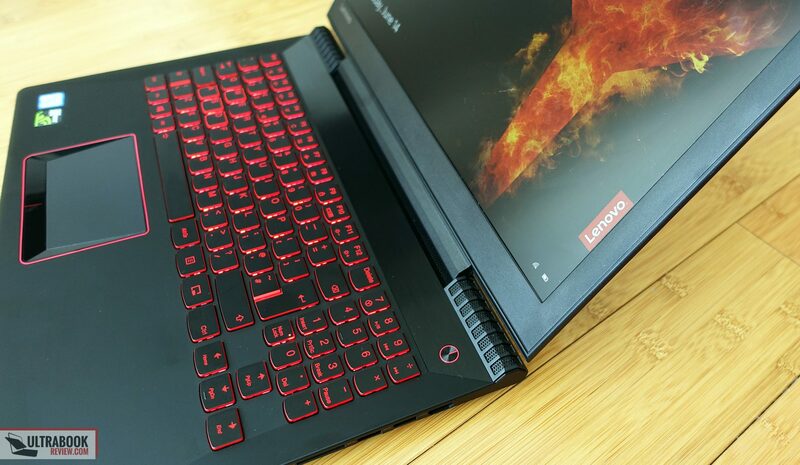 i erally would like to have your opinion on this because im gonna buy lenovo Y520 pretty soon. Hey there, do I need to keep my charger on even after the battery is 100% or do I need to unplug it at certain percentage to prolong the battery life? Thanks! You can keep it on. The system knows to cut off the battery when it reaches the set level of charging (100% or whatever else you're setting). Hi, i have used your .icc profile on my Y520 but the colors looked abit yellowish after applying. is this normal? 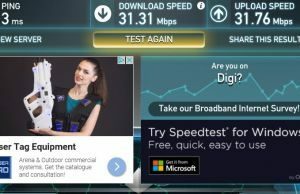 i have the same lg display as shown in this article. Well, yes, by default the screen has a blue tint and the corrected profile should make things warmer. 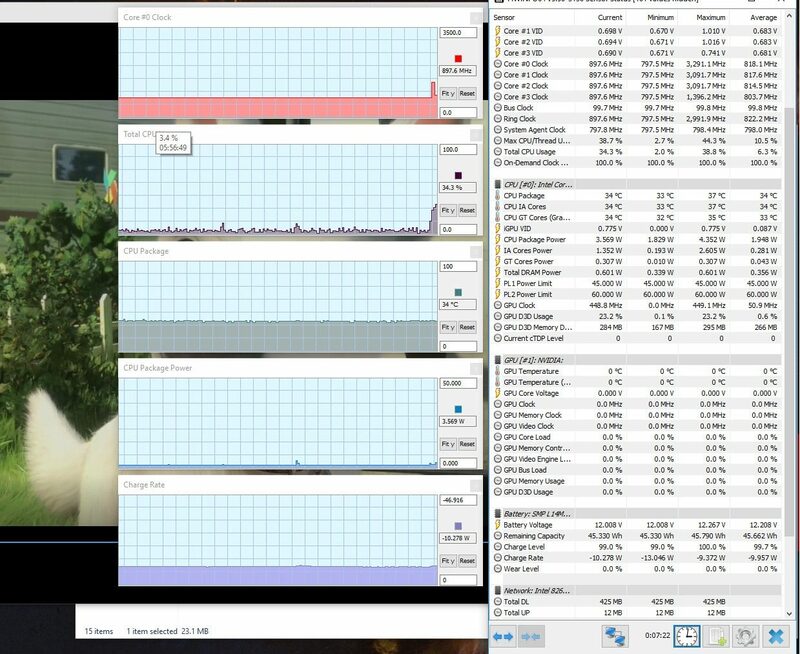 Still, the .icc profile is made based on my screen, even with the same panels there are variations between what each user might get, so the profile might not be great for everyone. .
"As an important note, this laptop only supports M.2 SATA drives, so don’t buy a PCIe SSD, you’ll not benefit from its faster speeds." – WiFi module is Realtek abgn/ac. 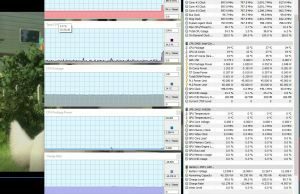 Not bad although but I'll swap it to Intel for better Linux support. Realtek drivers are a crap on Linux. 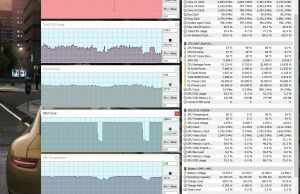 "As an important note, this laptop only supports M.2 SATA drives, so don’t buy a PCIe SSD, you’ll not benefit from its faster speeds." 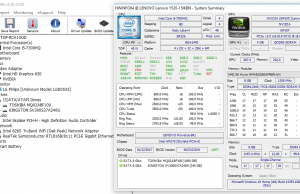 – Indeed it will benefit from PCIe SSD and only accepts PCIe/NVMe SSD-s. 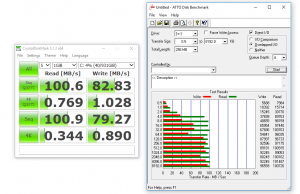 Slower SATA SSD-s won't fit. 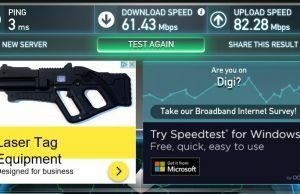 Maybe we have a completely different sub-config.. 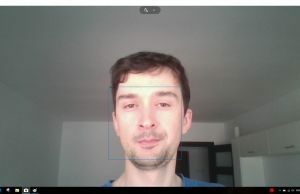 I'm also from Europe, Hungary. 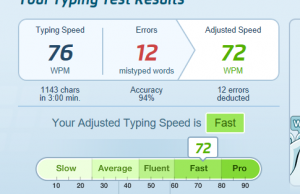 I saw some people having some keys is not responding.Did you face any keyboard while you were testing. No, but if you've read the post, I already mentioned a possible fix for it: "As a side note, quite a few users report issues with specific keys not registering on their Y520. 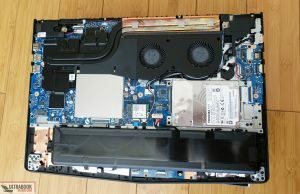 I didn't run into this issue, but it seems to be quite widespread and according to the forums, it's caused by the improper positioning of the metal shield that covers the RAM slots and can be fixed, as per the details in this thread (forums.lenovo.com/t5/Gaming-Laptops/Lenovo-Y520-Keyboard-buttons-are-pressed-when-nearby-surface-is/m-p/3635680#M5736). 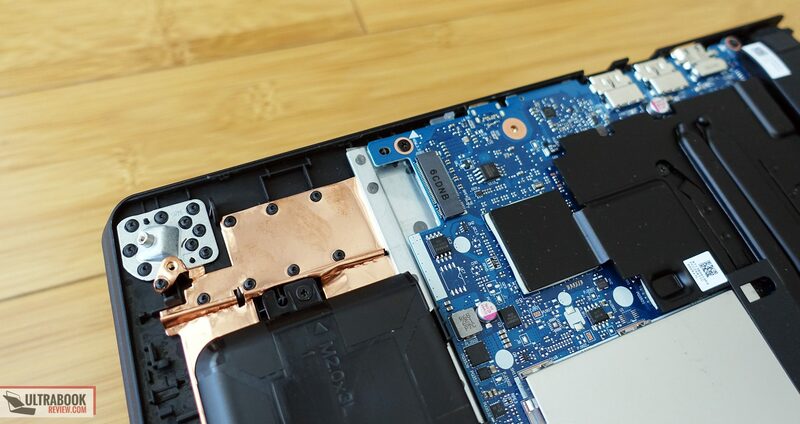 Chances are this issue will occur if you remove the shield in order to add more RAM to you unit, but there's also a fair chance that shield is wrongly placed out of the factory." Will be very grateful, if you can fulfill my wish. 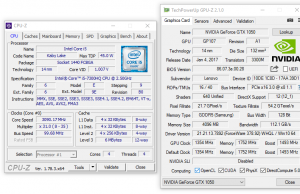 The Y520 should run GTA V at around 90FPS on high settings. This laptop is one of the worst pieces of junk I've regretted putting my money into. 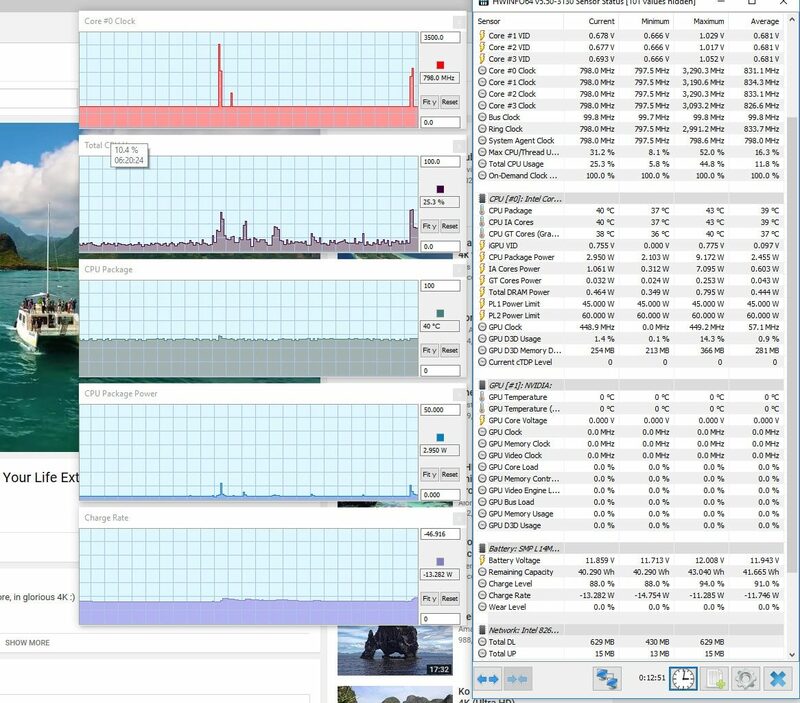 Granted I do not know whether its Lenovo's or Intel's or Nvidia's problem, but it sure as hell doesn't match up to my old low budget laptop from Dell. 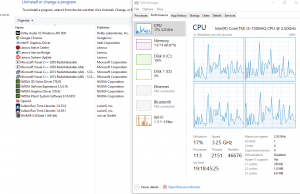 Don't get me wrong, Dell does have its design problems (which causes my old system to frequently overheat after about 1 year of use) which I hate, but the laptop had never once freeze over that required me to shut it down by pressing the power button. Lenovo's laptop however, required that kind of reset for at least 5 times already in only 2 months. Shameful.